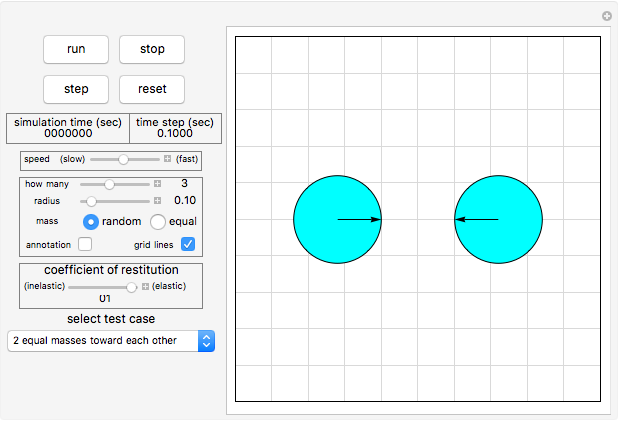 This Demonstration implements a physics collision detection device using a priori (continuous) collision detection to simulate the motion of particles in 2D. You can have up to six particles at the same time moving inside a closed unit square. Collisions between particles and the walls can be elastic or inelastic. The masses of the particles can be the same or different (randomly generated). No friction and gravity are neglected, hence the speed of the particles is the same after collisions. Four buttons are used to control the Demonstration. You select the number of particles and the radius of the particles, and then click "run" to see the motion in 2D. All the particles have the same size. You can change the collision from elastic to inelastic using the slider for the coefficient of restitution. You can see the current position, speed, and mass of each particle as it moves by using the checkbox labeled "annotation". As this is not a real-time simulation, keeping the frame rate synchronized with the time of collision in order to achieve smooth motion all the time was difficult. The occasional jumps in motion can be reduced by keeping the simulation speed slow (i.e., keeping the simulation time step size small). David Eberly, Game Physics, 2nd ed., New York: Morgan Kaufmann, 2010. Wikipedia. "Collision Detection." (Oct 21, 2012) en.wikipedia.org/wiki/Collision_detection. Nasser M. Abbasi "Particle Motion Simulation Using A Priori Collision Detection"